When was it that you had the first inkling that you should go to Mumbai as a poet / lyricist ? A J : While studying in VI std., I was frequently acting in plays in my school in Lucknow. 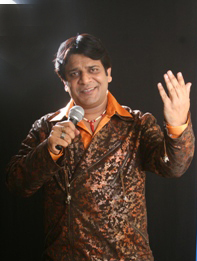 My singing, oratory and acting made me popular and it was perhaps the appreciation received from my teachers and friends that decided my career in Mumbai very early. I nurtured the idea ever since. While doing my graduation from AMU, Aligarh, I came in contact with Pt. 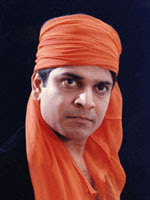 Gopal Das Neeraj Ji on regular basis. I started writing poetry and my visits to him served to reinforce my decision to work in Mumbai. After my graduation, I joined PG Course in Indian Theatre at Chandigarh because I wanted to understand this medium as much as I could before stepping into the world of movies. You can thus see that going to Mumbai was not merely a dream for me. It was a goal actively pursued by me. Most of the movies churning out of Bollywood are masala movies having no room for literary expression. Why then, a literary person like you should feel satisfaction writing lyrics in such movies ? A.J. : I cannot deny that most of the production from Mumbai is of 'masala type' - same old stories and situations being re-written ad nauseum. Even the names of the movies are often repeated. Since movie making is such a mega-budget venture, experiments are few and people stick to the tried and tested plots. The challenge before the lyricist is to bring something original in oft-repeated situation. I may mention here that poetry and lyrics are not always the same. A poetry is an outward flowing rhyming expression of poet's feelings and thoughts. But lyric is anything that is hummable and which can be sung on musical notes. It may even contain unintelligible characters and sounds. La-ra-la-ra can be part of a lyric but not of poetry. There is another difference - a major one. Lyrics convey the feelings and response of the character on the screen in a certain situation. As a lyricist I have to verbalize his or her feelings. I cannot and should not impose my personality on the screen artist. I must also know the cultural background and the intellectual level of the imaginary character the screen artist is living. It is vicarious thinking -- not an easy job by any means. Moreover, we often get a tune to start with. When a music track is given, we write words and sometimes sounds to fill the musical notes so that when it is sung on screen it would look natural and pleasant to ears and eyes. It is very much like stepping in someone else's shoes. The singer also has to be taken into account. Will our words come to his or her lips naturally? These are the questions before us when we sit down to write something. What about my later part of the question? A.J. : The literary expression ? The reason for working here in Mumbai should be self-evident. Moving images affect us more than anything else. It is an unimaginably powerful medium which gives us instant recognition - something of a stardom. Why Amitabh Bachhan saab is more readily recognised than his legendary poet father Dr. Harivansh Rai Bachhan? Can there be any doubt about the genius of the poet father Dr. Bachhan ? If people are taking notice of me, it is because of this medium of moving images. So, although not every piece of my writing here can be catalogued as literary work, I, as a poet, keep on looking for opportunities where I can offer something of timeless value. For great poets like Gulzar Saheb and Javed Akhtar Saheb and some others, such opportunities present themselves far more frequently than they do for new and young entrants like me. If I had stayed in Saharanpur - my home town, I don't think as many people would have heard of me as they do now. Here in film industry, when I write something good, great music directors work on it, legendary singers like Lata Ji, Asha Ji give it their voice, popular cine-artists give it their persona, the wide network takes it to the entire length and breadth of the country. It is talked about. People like it or dislike it but it gets noticed and that is important. Jungle main mor nacha, kisne dekha! Is writing a poetry for self is different from writing on a given musical composition and for a given scenario ? Which is more challenging & more satisfying ? There are great poets who are gems and are much adored in literary world. We hear them in kavi sammelan and mushaira and we read them in books. But some of them when assigned to write poetry as a lyricist, could not fit the bill and they failed. The reason is, a different kind of talent is required here. You have to work within a given framework and sometimes on a given tune. What you are writing must go well with the music. You cannot superimpose your personality over that of the artist who is to be seen singing it on screen. An understanding of the medium of movie also helps a lot. It is therefore a different kind of challenge. If the situation given is such that something of great literary value can be offered, the reward has no limits. People find you trying your hands in every field. You write poetry and lyrics, you are writing scripts too. Now I hear that you sang a song for Hazaron Khwahishen aisi and also for Shah Rukh Khan in Billu Barbar. You had also tried your hand in acting in the serial 'Lo-Kallo-baat' ! Who are you in your heart of hearts ? If there comes a law like one man - one post, which field would you chose for yourself ? I dislike monotony in life and therefore I don't think I am in mood of writing poetry 24 hrs. a day, 7 days a week and 365 days a year. Music is in my blood. I am a well trained theatre artist also. I want to laugh, sing, tell poetry and stories to people. Why should I always be in a sombre mood fit for serious poetry? In the hypothetical situation of a law prohibiting me to do more than one thing, I think I will go for poetry. Although thousands of girls flock to Mumbai every year to try out their luck in movies and TV serials. Why is it so that almost none of them are writers, lyricist, music directors, film directors and so on ? The fact that there are virtually no female artists behind the screen is quite strange and saddening too. As a lyricist, I can tell you that we male lyricists can only imagine the feelings of women for whom we write lyrics. The feelings of a female character can be experienced and authentically given voice to by a poetess only. Trying to be a successful music director or a lyricist is no more difficult for a girl than it is for a man. If they can come to Mumbai to try their luck in acting and singing, why not come for music direction, movie direction, lyrics writing! Perhaps not much girls know the mechanics of movie making. If there are some women in this field, almost all of them are daughters of film makers, directors, actors. They learnt the intricacies of film making, direction etc., in their homes. But for rest of the girls, what they see on screen is the start and end of it. They don't seem to be interested in what it takes to make a movie. They want to be on stage and not behind it. Do you say NO to an assignment if it doesn't suit your literary tastes at all ? Any incidence ? Sadly, the answer is yes. I won't name them but some people had come to me to write lyrics for a Bhojpuri film. What irritated me was their demand for songs full of dual meaning words. They told me that this is what film goers wanted in a Bhojpuri movie. I refuse to accept this contention that Bhojpuri film viewers are crude people with low and vulgar tastes. Crude tastes can be found everywhere - in Hindi, English or any language of our country or the world. Why dub such crudeness to Bhojpuri people only? If they are given movies with good artists, good music, good story and able direction, why will people reject it ? I lost that business because of my stringent views but I wish to walk with my head straight and I cannot do such things to myself or to the people of my country. Popularity of a song or poetry often depends upon the success of a movie or TV serial although sometimes reverse of it also happens. If a very good poetry or song goes down the drain because of failure of a movie, do you feel it justified ? In our country unpopular music has often caused a movie to be rejected and on the other hand a so-so movie can do good business here because of great music. If I write for a not so successful movie, my efforts seem to go waste with that. Personal albums do not gain as much popularity in India as film music albums do. However, writing for personal albums is good because here we don't have to work in confines and we can express ourselves fully. After handing over a song to the music director, do you still have a say while it is being composed ? If you are talking about me, my music directors welcome my presence while recording songs written by me. I happen to have an ear for music and witnessing a recording may sometimes improve the end result Also, if I happen to be available nearby, I can change a word or a line in my song if I feel a need to do so during recordings. Poets need inspiration or some stimulus to get their feelings on paper. Who inspires you? I regard Neeraj Ji (Shri Gopal Das Neeraj) as my source of inspiration. When I write something I ask myself - will he like it or not ? The answer often leads me to an improvement in what I had written on paper! I have always treated him as a university where I am learning poetry.